Saute onion in 1 tablespoon of butter. Then set aside. Cook remaining 4 tablespoons of butter with flour and whisk over medium heat for 3-5 minutes, stirring constantly. Add the chicken stock and simmer for 20 minutes while whisking. Add the broccoli, carrots and onions. Cook over low heat until the veggies are tender for about 25 minutes. The soup should be thickened by now. Add salt and pepper to taste. 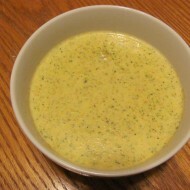 Pour half of the soup into a blender and puree. Set aside, and repeat with remaining soup. Return soup to pot over low heat and add the grated cheese. Stir until well blended.